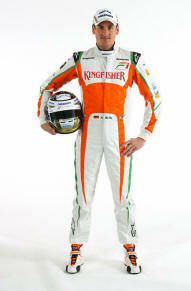 2010 Force India Driver Profiles. Adrian remains with Force India for a fourth consecutive season, hungry to achieve both his, and the team’s, ultimate goal of becoming a regular points and podium challenger. 2009 was Adrian’s most successful year in F1 since his 2007 championship debut. As the VJM02 steadily improved performance over the season, Adrian qualified seventh on the grid for his home Grand Prix in Germany and then put the car on the front row at Monza. After a hard race he secured fourth position and the fastest lap of the race, his best result to date in F1. Further impressive qualifying positions followed in both Japan and Brazil, where he qualified in the top four. Adrian got his break into F1 in 2006 when he joined the Midland F1 team for three Friday practice sessions. His speed and commitment impressed the team and he was signed on a multi-year race seat contract starting from 2007 when it became Spyker Formula One Team. The young German made quite an impression on the field; he shone in Monaco to head the timesheets in practice and then secured his, and the team’s, first world championship point in a rain-lashed Japanese Grand Prix that had claimed many more experienced drivers. For 2008, Adrian remained with the team in its new Force India guise. He did not score any points that season but again featured well in several races, including the Monaco Grand Prix in which he so nearly got an unexpected fourth position. Until his early teenage years, however, Adrian was destined for a career in music rather than motor racing. His father, Jorge, who had migrated from Uruguay to Germany in his late 20s, played the violin in the Müncher Philharmonie for many years and his mother, Monika, was also a talented musician. The young Adrian learnt to play piano to concert pianist standard. Adrian’s first contact with motorsport was when his brother took him to a karting track aged just 14. He never looked back to music and, instead, resolved to get to the pinnacle of the sport; Formula 1. In his first season in single-seater motorsport in 2002, he won the Formula Ford Swiss championship with 12 pole positions and 12 wins in 12 races. In 2004 he graduated to the Formula 3 Euroseries, securing four podiums in his maiden season. In 2005 Adrian moved to the ASM team, finishing second in the championship to 2008 F1 world champion Lewis Hamilton, with 11 podiums in 18 races. He also participated in three A1GP races for A1 Team Germany, but in 2006 moved across to the Far East to compete in the Japanese F3 championship. With strong performances throughout the year, Adrian secured his first international title with five wins, which paved the way to his first contact with F1 later than year.